You can earn quadruple points at these select hotels for stays between July 1 – August 31, 2016 that are booked this July. The list on the Accor’s website on the drop down menu is actually for the last month. The terms and conditions list the correct hotels, however, that I have above. 3. This offer is valid for a member’s stay from 1/07/2016 to 31/08/2016 in one of the participating hotels (Mercure Raphael Wien, ibis Styles Tübingen, ibis London Heathrow Airport, ibis Styles Gniezno, ibis Riga, ibis Styles Paris Mairie de Clichy, MGallery Grand Hotel Beauveau, ibis Styles Siedlce, Novotel RJ Botafogo, Sofitel Tamuda Bay, Pullman Sydney Airport, Novotel Bangkok Sukhumvit 20, Novotel Suites Hanoi, Novotel Bali Ngurah Rai, ibis Manado Boulevard City Centre), and booked between 01/07/2016 and 31/07/2016. 13. Please specify the reference 40285 in all your communications with AccorHotels call centers or customers care services related to this offer. 14. This offer can be used only 1 time(s) per member during its validity period. 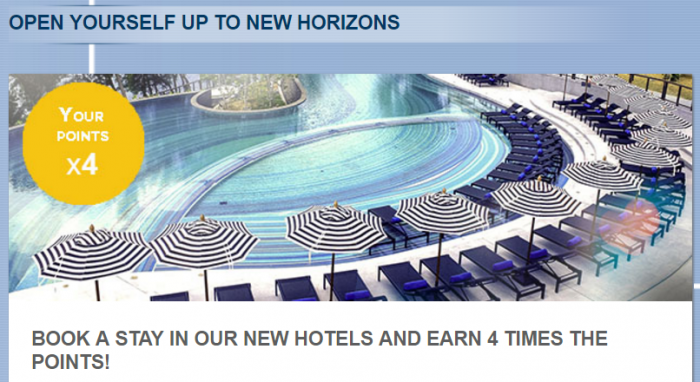 Next articleReader Question: Marriott Rewards Lifetime Total Points Disappeared?